September | 2012 | Mike Gil, Ph.D.
Well, I am finally back in the US of A, after a 3-month field season in French Polynesia. This was my 6th trip to the island of Moorea and my third summer there, conducting my dissertation research. But on this trip in particular, everything seemed to work out very well, on multiple fronts: several successful (and, as is expected, several not-so-successful) field studies, reuniting with old friends, meeting new friends, and simply enjoying the coral reefs and the islands they surround. 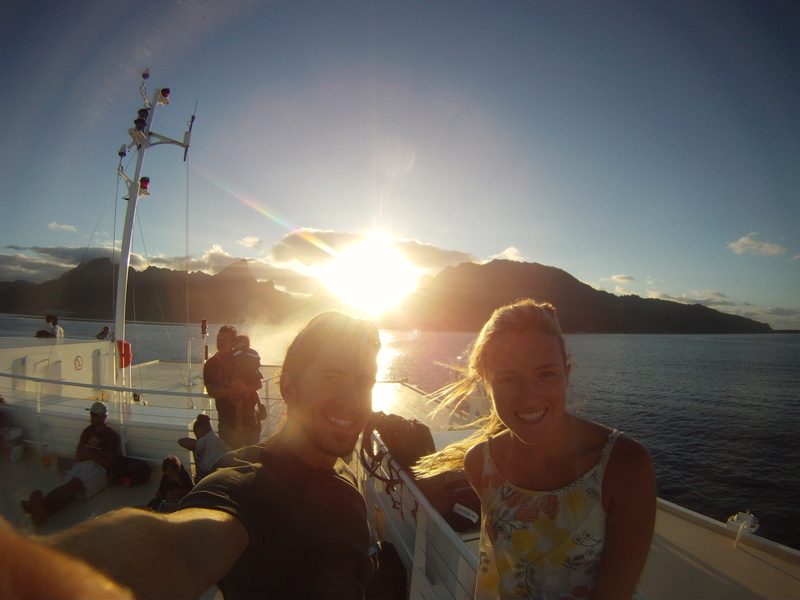 My assistant Julie and I, taking the ferry from Moorea (background) to Tahiti after a very productive field season. I hope family, friends, colleagues and perfect strangers have enjoyed reading some of my blog posts throughout the field season. It’s been a pleasure writing them, and I’m certainly not done yet! I have heaps of data and field videos to process over the next several months, and I plan to keep this blog updated with cool findings (like these) and interesting information along the way. Also, I’ve been given the unique opportunity to join a research expedition to study the Great Pacific Garbage Patch in the center of the North Pacific Ocean, during a 38-day passage from San Diego, California to Honolulu, Hawaii. As you might have guessed, I seized the opportunity (of course!). Soon I will, once again, be working on the SSV Robert C. Seamans (a 135-foot Brigantine sailing vessel) and leading a research project on board, as well as assisting with many other projects that aim to understand the biological and ecological ramifications of plastic pollution in our world’s oceans. We set sail October 2nd–just 3 weeks away! Stay tuned for more info.